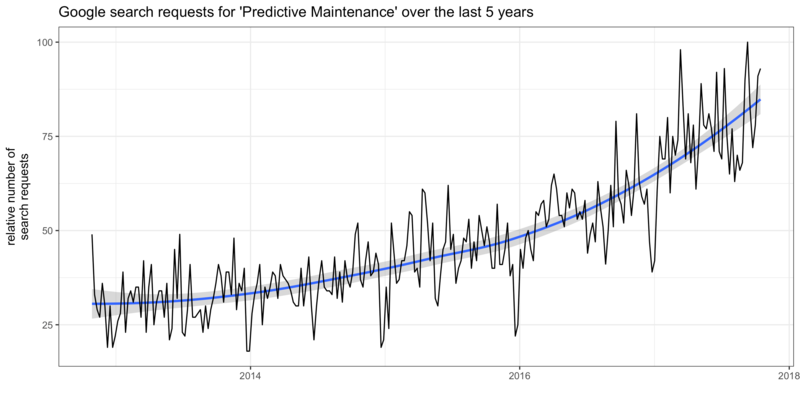 Predictive Maintenance is an increasingly popular strategy associated with Industry 4.0; it uses advanced analytics and machine learning to optimize machine costs and output (see Google Trends plot below). A common use case for Predictive Maintenance is to proactively monitor machines, so as to predict when a check-up is needed to reduce failure and maximize performance. In contrast to traditional maintenance, where each machine has to undergo regular routine check-ups, Predictive Maintenance can save costs and reduce downtime. A machine learning approach to such a problem would be to analyze machine failure over time to train a supervised classification model that predicts failure. Data from sensors and weather information is often used as features in modeling. With different analysis and modeling techniques, Predictive Maintenance can also optimize asset availability, productivity and output quality, extend machine life, lower safety risks and thus increase customer satisfaction. Predictive Maintenance is already being used with wind turbines, motor engines, cars and a multitude of other machines. It is often central to IoT technologies. You can interactively explore different analysis techniques for Predictive Maintenance with this flexdashboard (allow for a few seconds of loading time). Because Predictive Maintenance relies on large amounts of data collected over long periods of time, Big Data techniques are needed. Databases: The first step towards Predictive Maintenance is collecting and storing the data in an efficient and scalable way. There are many different ways to store Big Data, either in the cloud or locally, like Hadoop, AWS and many more. Modeling: Once the data is collected, machine learning models can be trained. When working with Big Data, we need model scalability and distributed computing. Here, we can e.g. make use of Apache Spark or similar cluster computing services. Prediction: When a suitable model has been trained, it can be used to predict future data points. With Predictive Maintenance, we generally talk about (near) real-time analysis. With flexdashboard RStudio provides a great way to create interactive dashboards with R. It is an easy and very fast way to present analyses or create story maps. Here, I have used it to demonstrate different analysis techniques for Predictive Maintenance. It uses Shiny run-time to create interactive content. Here, you can find the dashboard: https://shiring.shinyapps.io/demo_dashboard_pred_maint_fast/ (allow for a few seconds of loading time). 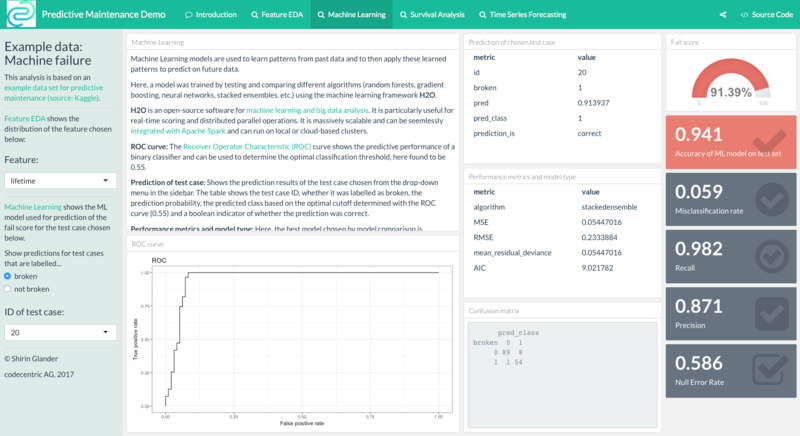 The dashboard contains an introduction to predictive maintenance (non-interactive), exploratory data analysis (here, you can select a feature for plotting), machine learning (here, you can choose a test case for which to show the prediction results), survival analysis (non-interactive) and time series forecasting (also non-interactive). Each section contains text that explains the content, data, results and plots. The source code for the dashboard can be seen by clicking on the </> Source Code field in the top right corner (code for preparing data and models is included as well but commented out). Shirin got her PhD in Bioinformatics. 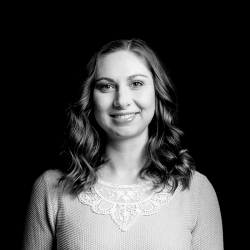 She applies various analysis and visualization techniques – e.g. machine learning, statistics, text analysis, etc. – to extract information from data and make it actionable.